31 Oct UB Connected Meeting Nov 5-6 in Chambersburg, Pa. The second annual “U.B. Connected” event this weekend at Rhodes Grove Camp (Chambersburg, Pa.) will begin with a Missions Conference from 3-5 pm on Sunday, November 5. All sessions of “U.B. Connected” are free and open to the public, with fees charged only for meals and lodging, but registration is required and may be made by telephoning Rhodes Grove Camp at 717-375-4162. Jeff Bleijerveld, Executive Director of UB Global, the missions agency of the United Brethren in Christ, will bring updates from the international conferences and missions districts. Featured speaker will be Rev. John Pessima, United Brethren Bishop of Sierra Leone, West Africa. Sierra Leone is the only Muslim-majority nation with freedom of religion. Bishop Pessima will share updates and needs of evangelistic efforts there. Sierra Leone is also the nation with the worst peace-time infant mortality rate; and, of its twelve provinces, Bonthe District has the worst infant mortality rate, and the only hospital operating in the mainland area of Bonthe District is the United Brethren hospital at Mattru Jong. Bishop Pessima will bring updates on the development of a bottled water processing operation on the hospital compound and the addition of a solar-electric system now at the end of construction there. A feature of the Sunday afternoon Missions Conference will be announcement of offerings and pledges from area UB churches in a cooperative effort to raise funds to complete the construction of a new UB Primary School in Pujehun, Sierra Leone. Following the Missions Conference will be a supper at 5:00 and a brief business meeting at 6:00 of the United Brethren Association for Church Development6. Evening Worship will begin a 6:30 with the praise team from Prince Street United Brethren Church (Shippensburg, Pa.) leading worship. US Bishop Todd Fetters will preach, and the Unity Service will conclude with Holy Communion, with music on the harp provided by Dr. Sherry Goertz, board member of Rhodes Grove camp and member of Blue Rock UB Church (Waynesboro, Pa.). After the Sunday evening worship, a fellowship reception will be sponsored by the Sider Insurance Agency. “U.B. Connected” will continue Monday morning with worship being led by Pastor Derek Thrush of Devonshire UB church (Harrisburg, Pa.). The session will feature preaching by Rev. Dr. Ray Seilhamer, former bishop and present pastor of Mount Pleasant UB Church (Chambersburg, Pa.). He will be followed with exhorting by Rev. Joseph Abu, a native of Mattru Jong, Bonthe District, Sierra Leone; Rev. Abu resides in Claymont, Delaware and pastors Mount Zion United African Church (UB) in Philadelphia. “U.B. Connected” is planned to bring all United Brethren people together at their traditional gathering place — Rhodes Grove Camp at Kauffman’s Station in Antrim Township. The United Brethren in Christ celebrated the 250th Anniversary of their beginnings in 1767 with a National Conference in July at Lancaster, Pa., where their founders first met in Isaac Long’s barn during a “Great Meeting” of the pan-German revival. Rhodes Grove Camp celebrated the 100th Anniversary this year of the purchase of the land by the UB Pennsylvania Conference in 1917 with the conclusion in June of a capital campaign that raised almost $400,000, more than any previous fundraising campaign. The camp also marked its 75th Anniversary of summer youth camps with an enrollment of 531 campers in ten camps over five weeks, their highest enrollment since 2004. This year also marked a new ministry with a satelite camp being held with Devonshire UB church in Harrisburg. The 50th Session of Family Camp was also marked over Memorial Day Weekend with a record attendance of 331 registrants and well over 400 for the Sunday evening session. The persons who attended the UB History course in Ontario. Bishop Brian Magnus and instructor Bob Bruce are sitting in front, third and fourth respectively from the left. The United Brethren Church in Canada sponsored the UB History course on October 23-24 at Stanley Park UB church in Kitchener, Ontario. Bishop Brian Magnus and Bob Bruce, pastor of spiritual care at Emmanuel Community Church (Fort Wayne, Ind. ), taught the course. 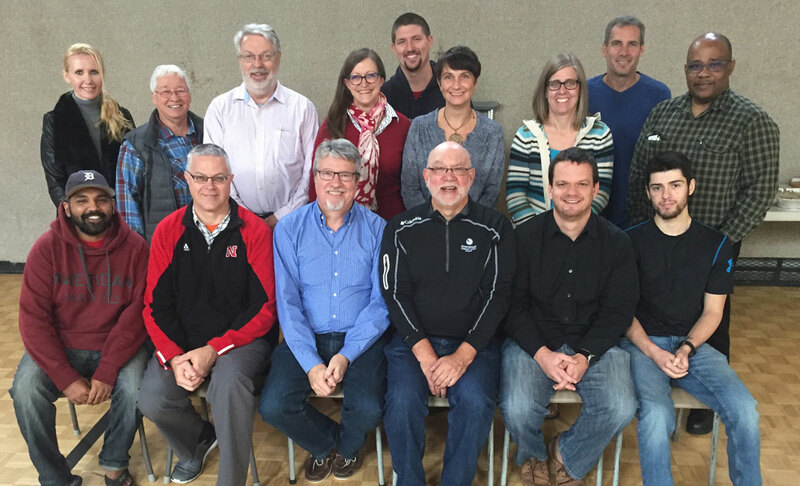 Ten new pastors and ministerial candidates took the course, along with three laypersons who audited the course to learn more about their inspiring heritage. The 1945 General Conference voted to open mission fields in two places during the next four years, in the Caribbean and/or Latin America. We then had mission work in just two places–in Sierra Leone (dating which back to the mid-1800s), and China (begun in the 1920s). There was no United Brethren presence south of the United States. General Conference didn’t name any specific places–just a resolve to do it, somewhere. But two places were already being considered–the Bahamas and Honduras. We had a contact in the Bahamas, a man with an independent mission work. And the year before, we had been contacted by Rev. James Elliott, who was overseeing several English-speaking churches in northern Honduras and was looking for another organization to assume supervision. 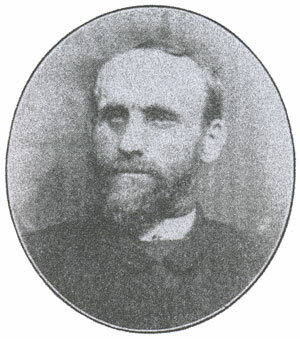 George Fleming, our Missions director, had already been corresponding with Elliott. In August of 1945, as atomic bombs fell on Japan and World War II came to a close, Fleming traveled to Honduras to look over the situation. He was impressed by what he saw. About 100 people attended somewhat of a congregational meeting, during which Fleming told of the UB church and entertained questions. The people were excited about the possibility of an American denomination coming to their aid. Fleming stayed for ten days, August 15-25, visiting the various stations of Elliott’s work. The La Ceiba church had about 150 members, all English speakers. The property, which he described as “pretty large for these parts,” was 30 years old and in need of repair. In better shape was the two-story, 52-by-30 foot mission house, which had been built ten years before. The lower level served as the mission school, and Elliott’s family lived in the upper level. The Puerto Cortes congregation was trying to rebuild its church, which had been flattened by a hurricane in August of 1944. Their one-story mission house now doubled as both a church and a school. The congregation in the port city of Tela rented a building for their day school and Sunday school, but were in the process of buying property on which to eventually build. This newer work had acquired a good following. However, with no regular pastor, services were held only when Elliott or someone else could make it. Other places beckoned for ministry. At the inland town of Progresso, a man had started a day school and was trying to organize a Sunday school; he had asked Elliott for help. A lady in Puerto Castilla needed help sustaining a day school and Sunday school. In both cases, Elliott lacked both the money and the people to come to their aid. Elliott estimated that carrying on the work and expanding it would require $5000–$6000 a year. After returning to the States, Fleming took a glowing report to the eight men on the United Brethren Parent Board of Missions (at the time, the Women’s Missionary Association was an entirely separate missionary-sending organization). They voted unanimously, 8-0, to launch into Honduras. The date was October 26, 1945. The United Brethren church had established a foothold in Latin America. On October 22, 1853, a 20-year-old Virginian named Zebedee Warner was granted a United Brethren preaching license. A man of strong intellect, Warner had considered careers in medicine and law before recognizing that God had an even higher calling for him–the ministry. 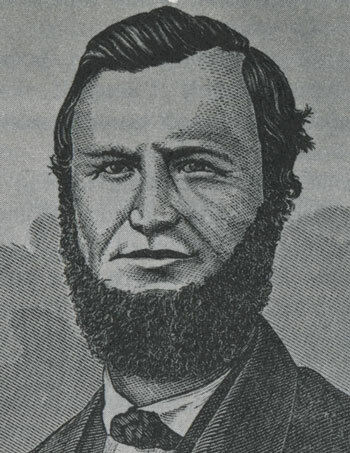 In 1858, Warner was part of organizing the Parkersburg Conference in what is now West Virginia (it became a state in 1861). 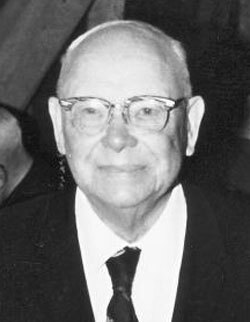 From the start, Warner was considered the leader of Parkersburg Conference. It was considered perhaps the most rugged territory in the denomination, with rugged mountains, thick forests, and bridgeless streams. One time, after Warner rode toward his log cabin after what was described as “an unusually long absense,” his three children came running to meet him. A kick from Warner’s horse struck the youngest daughter on the head, killing her instantly. Warner also despised alcohol; in 1882, he canvassed the entire state and organized temperance forces in every county. Warner was a General Conference delegates from 1861-1885, and was influential in moderating the stand against secret societies (which helped lead toward the division of 1889). 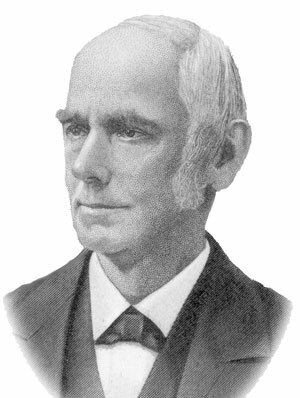 Warner was also a trustee of Otterbein University, and in 1878 was awarded a Doctor of Divinity degree. In 1887, Warner accepted a pastorate in Nebraska. He died there a year later. Jacob John Glossbrenner, Bishop 1845-1885. Maria Glossbrenner died on October 14, 1883. She and her husband, Jacob, had been married for 50 years. For 38 of those years, he was a United Brethren bishop, with two more years to go on what would be his final term. They had celebrated their 50th anniversary earlier that year, on February 14, 1883. Maria grew up in Churchville, Va. Her father, Christian Shuey, kept his home open to traveling preachers. Jacob Glossbrenner, as a young itinerant preacher, frequently stayed there as he made the rounds of his scattered churches. “My first solemn covenant was when I embraced Christ. Then I consented to live for Him and to die for Him. From Him I have not been separated. At 18, I embraced religion, and have no cause to regret it. “The second covenant was when I became a member of the church. I have not felt like leaving the church. The church has been faithful to me. It is better to hold on to this covenant. “The third marriage was when I took the vows of a Christian minister–when I consecrated myself to Christ fully. The church has branches. I joined with the United Brethren in Christ as a minister. The Church was then small. It was then weak. The Church has treated me well. In the church let me live; in the church let me labor; in the church let me suffer, if need be; in the church let me die, and stand at last with the white-robed throng of the church triumphant. The Glossbrenners had six children; one died in infancy, but five daughters grew to adulthood. Three daughters married Lutheran ministers, and one died a year after marrying Rev. D. K. Flickinger, a future bishop and missionary to Sierra Leone. Turned out to be Maria. Bishop Glossbrenner’s health returned somewhat, and he continued in ministry to a limited extent until his death on January 7, 1887. 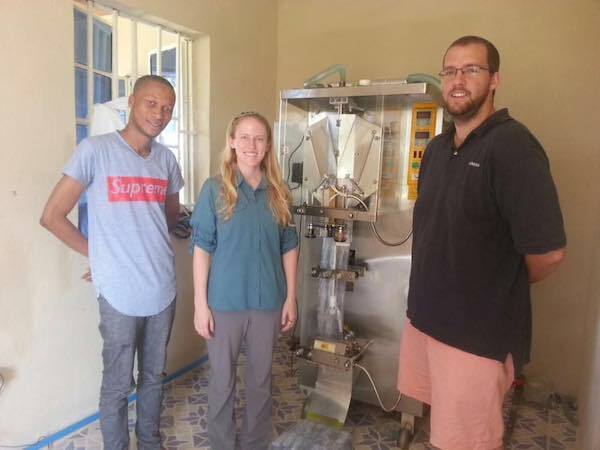 Lizzy Kolar and Matt Asher (right) with the water packing equipment now installed at Mattru Hospital. Matthew Asher has been serving at Mattru Hospital since February 2017. He left his engineering job to become the lead engineer for the solar and water projects at Mattru Hospital. The Sola Wata Water Packaging Center was launched in July, becoming the area’s first center for treating, packaging, and distributing water. In September, Matt was joined by Lizzy Kolar, a fellow graduate of West Virginia University’s Statler College of Engineering and Mineral Resources. Kolar, a mechanical engineer, is taking a three-month sabbatical from her job with General Electric to work on the business side of the water project–marketing strategies, data management, employee training, work procedures, etc. She will also help Matt install the solar-energy system at Mattru. Here is a good article about Matt and Lizzy, published by their alma mater. The Bright family, with connections to British statesmen and church leaders, emigrated to America in the mid-1700s. One Bright family settled in central Ohio (which became a state in 1803). There, J. C. (John Collins) Bright was born on October 13, 1818. He would become a pioneer in United Brethren missions. He could even be considered the Father of UB Missions. 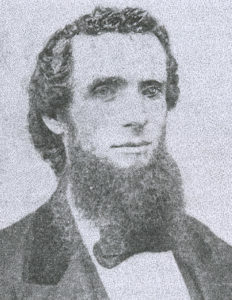 Bright became a United Brethren minister in 1841, at age 23. He continued as an itinerant preacher for 12 years, holding revivals and organizing new churches. Bright’s impassioned writing and eloquent speaking moved people to come alongside in taking the Gospel not only to the Wild Wild West, but to other countries. During those four years, missions were started in a number of states and territories–Nebraska, Minnesota, Missouri, Kansas, Oregon, Tennessee–as well as in Canada and in Sierra Leone. But after four years of pushing himself relentlessly, Bright suffered a nervous breakdown. After recovering his health in a Cleveland sanitarium and spending some time in secular work, he finally returned to ministry in 1865. Bright became pastor of a struggling, 25-member UB church in Galion, Ohio. He would spend hours each day in prayer, asking God to bless the work. In December 1865, he began a series of meetings which continued into February, and which saw 200 people become Christians and 160 of them join the church. Bright proved to be a pioneer in another area: church music. At the time, many United Brethren staunchly opposed using instruments and choirs in church. But Bright, noting that people liked music, bought an organ for the church and organized a choir. William Weekley says this was the first United Brethren church in the denomination to use instruments during church services. In March 1866, Bright suffered a second nervous breakdown. His health plummeted, and he passed away on August 6.